Would you drink from River Krishna? 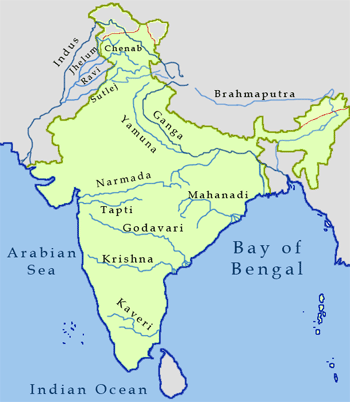 The third longest river in India, Krishna, flows through the state of Maharashtra and meets the Bay of Bengal in the end. The regions of Satara and Sangli receive its bounty. However, a news channel this morning displayed the blame game the people here play. The public blames the sugar industries and the environmental scientists blame the people. What’s the truth? One of my relatives hails from Sangli. Sangli’s co-operative sector has 10 sugar factories and the industrial sector has the other 10. A few years back he complained that his family and people around were falling sick due to water pollution caused by sugar industries in the area. Not sure where he got that information from so I called up the pollution control board. MPCB denied any pollution caused by the sugar industry the relative mentioned. 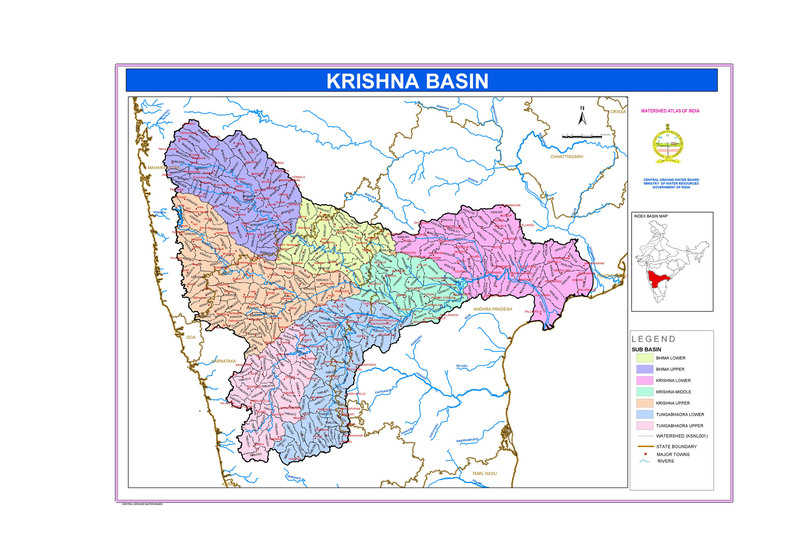 To study and manage water, the Watershed Atlas of India provides a systematic picture of river basins in the form of watershed maps. In the image below, you can see the various shapes water takes on land before it becomes a river. Rainfall from the mountain overflows down into what we call ‘catchments’. A group of these catchments form ‘sub-watersheds’. A group of sub-watersheds forms a ‘watershed’ and a group of watersheds form a ‘basin’. In Watershed Atlas of India, the entire river systems of the country have been divided into 6 Water Resources Region, which has been further divided into 35 basins and 112 catchments. These catchments have been further divided into 500 sub-catchments and 3237 watersheds. Basins, catchments, and watersheds are hydrological units that provide a system boundary for analysis. Analysis like computation of water balance parameters helps in the implementation of water management schemes. The Central Pollution Control Board of India (CPCB) collaborates with State Pollution Control Boards (SPCBs) concerned with the river basin. In the case of Krishna river, it is the pollution control boards of the states of Maharashtra, Karnataka and Andhra Pradesh. Since some of the water goes underground, known as groundwater, two kinds of monitoring are done – surface water monitoring and groundwater monitoring. In the country, surface water monitoring is done on a monthly or quarterly basis and on half yearly basis in case of groundwater. The monitoring network in the country covers 445 Rivers, 154 Lakes, 12 Tanks, 78 Ponds, 41 Creeks/Seawater, 25 Canals, 45 Drains, 10 Water Treatment Plant (Raw Water) and 807 Wells. Among the 2500 stations, 1275 are on rivers, 190 on lakes, 45 on drains, 41 on canals, 12 on tanks, 41 on creeks/seawater, 79 on ponds, 10 Water Treatment Plant (Raw Water) and 807 are groundwater stations. In my notes, I’ve defined the parameters that these stations use to infer the water quality. You can find my notes here. One of them is Biological Oxygen Demand (BOD). BOD is ‘a measure of the oxygen utilized by micro-organisms during the oxidation of organic materials’. It indicates the amount of organic material present in water or the amount of ‘organic waste’ in it. Drinking water usually has a BOD of less than 1mg/l, and water is considered fairly pure with a BOD of 3mg/l. But, when the BOD value reaches 5mg/l, the water is of doubtful purity. Below is a picture of the water quality trend of BOD in River Krishna. On an average, looking at the mean values, it looks fairly pure. That doesn’t mean it has been this way the whole time. It has gone through spikes, as seen from the maximum values, which means it has been highly impure at times. Why has the water gone from pure to impure, and to the extent that it reaches values like 17 mg/l? Other than BOD, there are other important parameters such as Dissolved Oxygen (DO) and Coliform levels. Following are results from the water quality monitoring stations in Maharashtra. Drinking water should have Total Coliforms (TC) to be 50 MPN/100 ml or less and DO to be 6 mg/l or more. The graphs show unevenness in this regard. The DO is hanging low from 6 mg/l and TC is seen shooting way higher than 50 MPN/100 ml. Coliform bacteria are organisms that are present in the environment and in the feces of all warm-blooded animals and humans. Coliform bacteria will not likely cause illness. However, their presence in drinking water indicates that disease-causing organisms (pathogens) could be in the water system. Clearly, the water is not of the right quality and it is either the industries or the people that are contributing to it or both. Here’s a screenshot of an annual report (2004-05) that talks about steps taken to improve the water quality of this River.